Selected volcanoes/volcanic areas in Utah mentioned in text. Utah contains the three main types of volcanoes. The following is a brief introduction to Utah’s volcanoes; only several of numerous volcanoes are mentioned. Two examples of Utah’s stratovolcanoes are Mount Belknap in the Tushar Mountains and Monroe Peak on the Sevier Plateau. Compressional forces had eased, and the crust started to stretch between the Wasatch Range in Utah and the Sierra Nevada Range in California. This extension created splintered zones in the Earth’s crust where magma rose to the surface creating shield volcanoes and cinder cones. 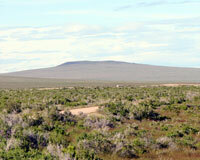 The most recent volcanic activity in Utah occurred about 600 years ago in the Black Rock Desert (Millard County).